When Tej Pratap called the inspector asking for the reason behind his refusal to register complaint, the officer talked rudely with him. 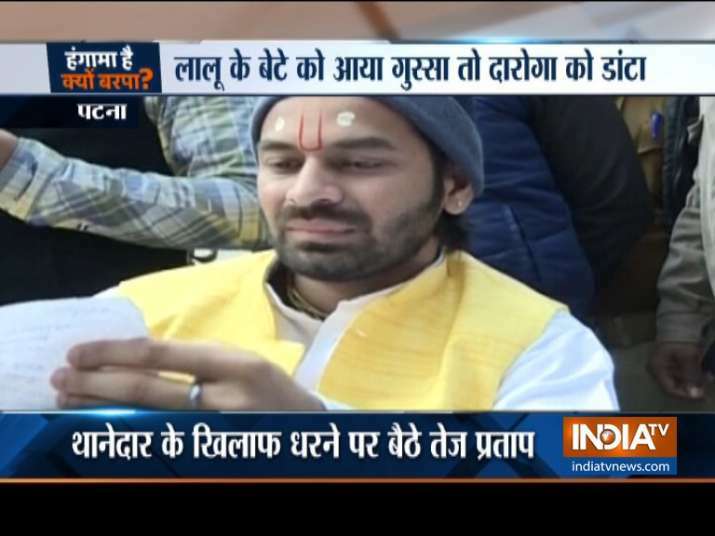 Tej Pratap Yadav, son of RJD supremo Lalu Prasad Yadav, got irked by the response of an Inspector over phone in Patna. A woman came to the Janta Darbar asking for help from Tej Pratap. The woman alleged that the inspector refused to register her complaint in connection with the killing of her sister by her in-laws. The inspector's behaviour infuriated Yadav, prompting him to walk to Fulwari Sharif police station. Upon reaching there, Yadav threatened the inspector by saying that his government was going to be formed in the state in the near future. Explaining his side of the story, the inspector said the women never reached out to him otherwise he would have registered her compalint immediately. Taking a swipe at Nitish Kumar government, Yadav said under the ruling dispensation law an order had crippled in the state.